This TA Technix sport suspension kit is for the Chrysler PT Cruiser type PT from 1999-2002 without Convertible. 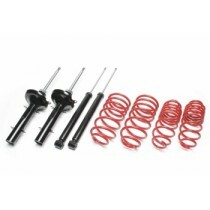 This TA Technix sport suspension kit is for the Chrysler Stratus type JA / JX from 1995-2001. This TA Technix sport suspension kit is for the Chrysler Voyager type GS from 1995-2000. Lowering is only available on the front axle. This TA Technix sport suspension kit is for the Chrysler Neon MK1 and for the MK2.